I wasn’t expecting to see such a well-done sporting explanation in this comic. There’s a great rundown of the basics of roller derby here, which I would have expected instead to see in Boom!’s title Slam! In the latest chapter of the series, written by Shannon Watters & Kat Leyh and illustrated by Carolyn Nowak, the campers have made a bet with a renegade group of sasquatches. The beasts have taken over the yetis’ tree house, and the only way to get them out was apparently to challenge them to roller derby. I thought it was an insightful character bit that, after explaining this to their counselor Jen, she’s happy to participate as referee because she loves following rules. There’s also a good emphasis on making sure everyone’s safe with their skating, and a great group of derby names for the “Rumblejanes”. Artistically, I admire what Nowak has taken on. 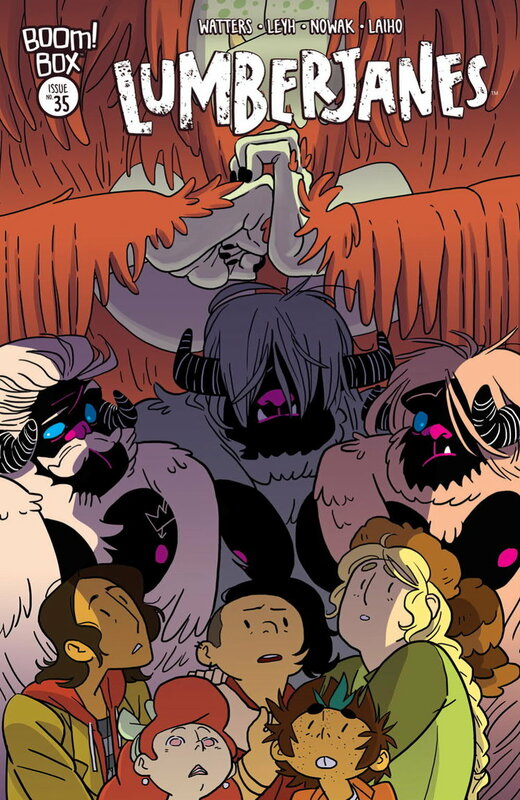 The scale of the girls and the monsters are so different that it can be tricky to fit them both in the same panels, when they appear together. The yeti and the sasquatches have different designs so we can tell the two giant, hairy, ape-like sets of figures apart, although I find the mask-like faces of the sasquatches creepy, but heck, they’re the bad guys. I like the way Nowak is careful to establish settings with detail, and the skating comes across as fun. The match has just gotten started when the issue concludes with a cliffhanger on several fronts to bring us back next month.